2/16/2010Share this story on Facebook! 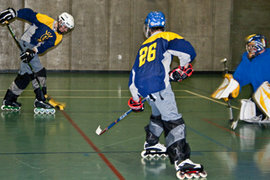 The Ithaca roller hockey team practices in the Fitness Center. What's the Difference between Varsity, Club, and Intramural Sports? Club sports are a middle ground between varsity athletics and intramural sports. Like varsity teams, clubs have coaches and hold practices, and most compete against other colleges and universities. Unlike varsity athletes, club members have more flexibility with their participation. Each athlete can decide how much time to invest in the club. Club teams generally practice three times per week, so the time commitment is much less than for an official varsity squad. Similar to intramural sports, club sports are primarily for recreation, even if they compete. In intramurals, there are no practices or tryouts; teams are made up of IC students playing with and against their peers, for fun and exercise. The men’s roller hockey squad, one of the newest club teams on campus, broke their season-long nine-game losing streak, beating Loyola 1-0. Last year, some Ithaca College students showed an interest in roller hockey and ended up playing eight games throughout upstate New York. This year, the club became an official member of the National Collegiate Roller Hockey Association, which has over 200 teams and 2,500 players nationwide. Over the course of the regular season, which runs from October through March, Ithaca plays a total of 15 games against the other Eastern Division III teams: SUNY Cortland, Syracuse, University of Massachusetts at Amherst, Ramapo, Delaware, Scranton, Loyola, and Northeastern.